We’ve seen a couple sculptors so far, but most of the work we’ve seen so far has been painting. This week we do a little catchup, and see what’s been happening so far in the world of three dimensions. We start with two sculptors from the 50′s David Smith and Louise Nevelson. Although they followed tendencies from European Modernism (found object assemblage, balanced compositions, biomorphic shapes), and AbEx tendencies (the brushed aluminum surfaces of David Smith look like expressionist brushwork, for instance), these artists were also free to follow Greenberg’s advice that artworks should concentrate on their own specific medium. This meant that sculpture in the 1950s often worked in it’s own world, inventing modernism on it’s own terms. We then look into a couple art movements that are loosely tied together, Minimalism, Conceptualism and Earthworks. Many of the artists in these groups could be placed into more than one category, so I’ve pulled out some representative samples just to give you a flavor of these different movements. Unlike the Abstract Expressionists, or even the Pop artists, these are not artists who felt grouped in a common purpose. In fact they often occupied distinct perspectives on the work and their reason for producing it. Interestingly, we see that the more similar the work of artists is, the more likely it is that they are going to need to describe what it is that they personally are doing, and how it differs from others who are doing a very similar thing. Robert Morris made boxes that were more about places to perform, or making the viewer aware of his or her body in space, than the craft of making them. Frank Stella painted lines, but never wanted to give up the history of painting or painterly illusion, even when his pieces resembled aluminum slabs suspended on the wall. Donald Judd wanted more than anything to upend traditional concepts of art, and creates the “Specific Object” that is “neither painting nor sculpture” by drafting plans for factory produced objects constructed of exotic industrial materials. 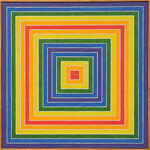 Sol Le Witt saw that the Idea was as interesting as the piece, and produced descriptions of works that were then brought to completion by assistants in his absence. No matter the distinctions these artists made amongst themselves, they still created a collective body of work that felt cohesive enough to outside observers, and seemed relevant enough in it’s comments on modern life, assembly, and mass production, to earn the lasting label of Minimalism. We now live in an age where we think about preserving the wild as much as protecting ourselves from the elements. But first we have to back up a bit, to the beginnings of the environmental movement, when earth artists were not making necessarily political statements, but just working in the landscape as movers of dirt. If anything is this lecture can group all these artists together, it would be the notion of Scale. We start with Robert Morris and Richard Serra, artists still working within the gallery setting, but pushing the envelope of what can still fit within four walls. In some cases the expansion is illusionist in nature, by use of mirrors which reflect space, or lights which fill the room with their glow. Other times it is by perceived weight, or presence, as with Serra’s steel pieces threatening to crush the viewer. Next, we follow these tendencies into the open air, and look at Robert Smithson and James Turrell, two artists who push the boundaries of what you can even call a sculpture. Jetty’s, buildings, cities, mountains, all of the earth’s natural and man-made surfaces become possible canvases for artistic ideas. I came across an article in the ‘New Yorker’ magazine, September 17, 2012 issue about Gerhard Richter. His digital print, “921-4 STRIP”, does Frank Stella one minimalist better. According to the author, Peter Schjeldahl, “The lateral blurs of parfaits, like concentrations of pure velocity, allow your gaze no rest. Fiercely 3-D illusions, generated by adjacent advancing and receding colors can induce veritgo”. This description also reminded me of Hans Hoffman’s theory of push pull.